The Vancouver Condo Buzz » From low $300’s > Panorama Surrey ETON Townhomes for Sale by Fairborne > Spacious 2 to 3 bed+flex Townhouse Layouts Plus Great Location! « SUMMER UPDATE! North Vancouver’s LOCAL on Lonsdale Condo Tower Nearing Completion (Final Release from low $300’s!) -PLUS- New Central Lonsdale Loblaws CityMarket Grocery Store Opening in July! From low $300’s > Panorama Surrey ETON Townhomes for Sale by Fairborne > Spacious 2 to 3 bed+flex Townhouse Layouts Plus Great Location! Eton Surrey is an exclusive enclave of Georgian inspired, two bedroom, three bedroom and three bedroom + flex townhomes buffered by a permanently protected green space and surrounded by a sense of community pride and confidence that comes with owning one of the finest homes in Surrey real estate market. Two bedroom, three bedroom and three bedroom + flex Surrey Eton townhomes built over three carefully considered levels with a design aesthetic that balances classic sophistication and contemporary grace is being offered here by Fairborne Homes, our favourite boutique developer. The main floor at Eton Surrey townhomes for sale feature an open concept layout that flows freely from the kitchen into the great room. And, as you might expect from a home of this quality, there are three bathrooms including a master ensuite of superior quality. The evolution of perfection. Your life has evolved, so too has your definition of a perfect home. Inspired Georgian architecture, these character-built Panorama Surrey Eton townhomes are located in a central, convenient location within a private, picture perfect enclave. Eton Surrey presents a place where all the everyday amenities and conveniences are located within a four-block radius. Located in the Panorama Surrey real estate district, the new Eton Townhomes is brought to you by boutique developer, Fairborne Homes. The new development will have stylish Georgian inspired architecture featuring cream painted brick and paneled bay offsets with trims which will give the community a very distinct and beautifully established look and feel. The floor plans at the Eton Surrey townhouses will include both two and three bedroom open concept and functional layouts. Featuring cream painted brick and paneled bays that offset the trim, these truly unique and very attractive homes are coming to the market in mid to late 2013. The project site location for the new Panorama Surrey Eton townhouses is at 62nd Avenue between 148th and 152nd in Surrey BC. More information is coming soon. 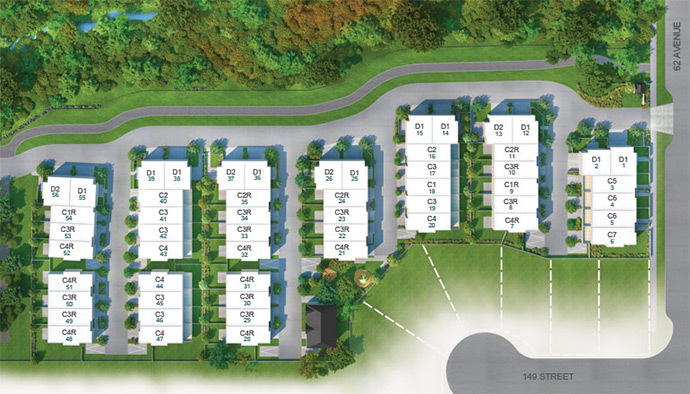 A collection of exclusive honey-hue townhomes in Panorama Surrey is now launching! Nestled within a permanently protected green space, these remarkable Surrey Eton townhomes for sale are very close to top ranked schools, shopping, transit and everything that a homebuyer would expect from a great neighbourhood. More information is online at www.etonliving.com or visit the Fairborne website at www.fairborne.com. Visit the new Surrey Eton designer showhome! They will be open 12-5pm daily (except Fridays) from July 20th onwards. There are 3 series of distinct layouts here at Eton Surrey Panorama townhomes. The first is the D1 Plans which are roughly 1,400 square feet with a two car side-by-side garage. They include 3 bedrooms + flex room and 2.5 bathrooms (powder room on main floor). The C4 Eton Surrey floor plan series is slightly larger at 1,450 square feet and it features 3 bedrooms and 2.5 bathrooms and a tandem double garage. The C3 Plan series of Surrey Eton floor plans features 3 beds and 2.5 baths over 1,435 square feet also with a tandem double garage. The bright and airy open concept floor plans are both functional as well as spacious. A great balance in traditional and contemporary interior specifications is presented in this property with Beaulieu carpeting in the upper floors and wide plank laminate wood floors throughout the main floor. The living rooms at Eton Surrey Panorama townhouses will also feature an Optiflame electric fireplace with a built in Purifire Firebox and custom surround. The kitchens will have flat front square lined cabinetry as well as double thick granite countertops and modern hardware. There are stainless steel double bowl sinks, standard single lever pull down faucet, pantry closet, Lazy Susan, casual and formal dining rooms as well as full height porcelain subway tiled backsplash. The top quality stainless steel appliance package by Fisher & Paykel and Frigidaire complete the fabulous kitchens. The bathrooms at the new Surrey Eton townhouses will feature ensuite bathrooms with deep soaker tubs and separate walk in glass showers in addition to flat front square lined cabinets, brushed nickel pulls and brushed steel sconce lighting. The master bathrooms will also have full width vanity mirror, seamless transition of marbled porcelain tiled flooring to the walls, his and hers sinks and great lighting. All homes come with the Travelers 2-5-10 New Home Warranty. GRAND OPENING ANNOUNCEMENT > July 20th at Noon Sharp! Only 55 homes are available in this family friendly Panorama development in Newton Surrey. With an amazing WOW FACTOR, the Eton Surrey townhomes will feature generous layouts with 2, 3, 3 bed+flex floorplans that are ideal for growing families and couples. Situated next to a green space/enclave that is protected, live in this quiet neighbourhood today! There’s 3.3 acres of green space surrounding your new home! The architecture of the new Panorama Surrey Eton townhomes is inspired by the grand Terraces of London’s Chelsea district and will be unique and timeless. The true Georgian inspired pitched gable roofing, oversized windows and Tudor style bays with black trim are other amazing exterior details that you will love. Inside these homes are spectacular functional layouts that feature oversized windows, open plan layouts as well as oversized outdoor living spaces and amazing kitchens with all of the modern finishes and features that you are looking for. The new Eton Surrey townhomes will also feature two exclusive community clubhouses. Some of the floor plans will feature side-by-side two car garages and walk out backyards from the main level of living space. The designer show home and sales centre launches July 2013. The Eton Townhomes in Panorama Surrey real estate district will be priced from the low $300’s, making them very affordable for first time buyers as well as families. 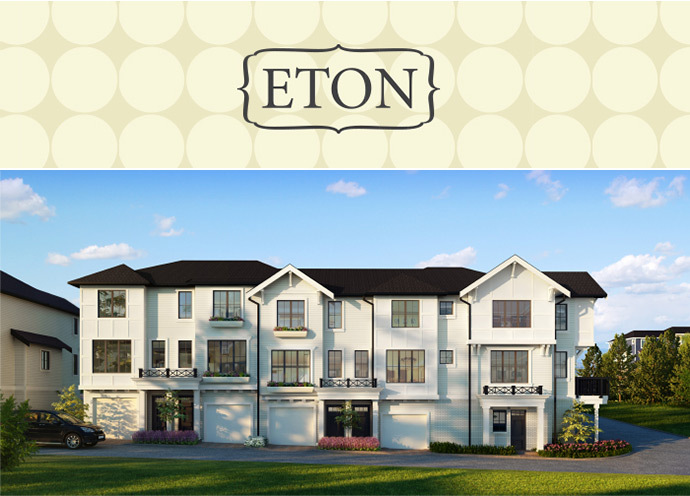 Nestled within a permanently protected green space, Eton Surrey townhomes for sale is an exclusive Panorama enclave of 2 bedroom, 3 bedroom and 3 bed+den townhouses built to the most demanding requirements of all – your expectations. Priority register for this new Fairborne project today! From Eton: From the moment you arrive at Eton, it is obvious there is something special about these homes. The collection of 2 bedroom, 3 bedroom and 3 bedroom + den townhomes share views of the tree tops and the two acres of permanently protected green space directly west. Every home features a refined, creamed honey colour palette with bold black accents, oversized windows, handsome garage spaces and entertainment sized outdoor spaces. A limited selection of homes will feature side-by-side garages and walk out backyards off the main level of living. Prices start from the low $300,000’s and it is currently in presales and preconstruction. The developer is Fairborne Homes and there are only 55 units for sale.